If your grip is what suffers most during rainy games, then it’s about time you considered getting yourself a new pair of golf rain gloves. 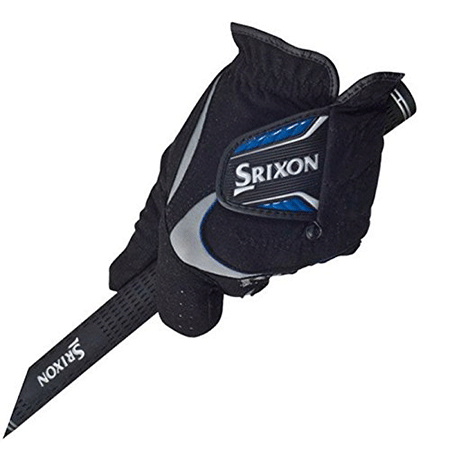 Srixoin Golf Gloves are not newbies in the golf gear industry. A lot of their products are of impressive quality and quite reliable. These are among the few options out there that come in pairs, which makes them even more worthy of your attention. These Sirxoin Rain Gloves feel a bit thicker than the high-end Nikes and Callaways, but their impressive build quality makes up for that slight downside. On the score of resilience from wear and tear, their construction does not leave much to be desired. There have not been a lot of complaints about the fit and we found it to be quite snug; appropriate for a rain glove of this class. 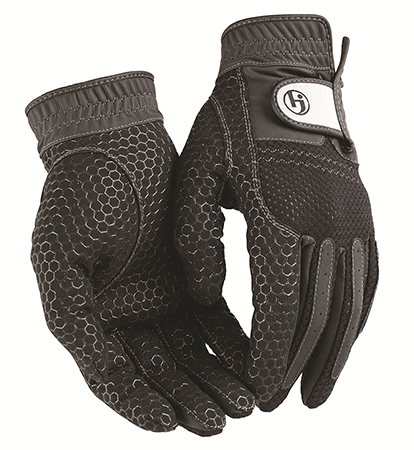 Overall, the gloves can be described as adequate when it comes to enhancing your grip in moderately slick conditions. Callaway have done an excellent job on their all-weather X-Spann rain gloves. Golfers with larger hands especially love this pair for the way it fits perfectly on their hands. Undoubtedly, the compression fit gloves are popular among golfers who really just want a second layer of skin-like fabric to aid their game in wet conditions. These gloves do more than just enhance your grip thanks to silicon chevrons and full palm cabretta leather; they incorporate the soft, moisture-wicking and extra breathable microfiber suede for the ultimate comfort when playing. Perfect for sweaty palms and rainy afternoons, the Callaway X-Spann rain gloves are a premium choice for golfers of all calibers. If you’re working with a small budget, these weather-ready HJ rain golf gloves are quite the steal. Their aesthetic design is pleasing, to say the least, with a sleek, textured, black exterior that looks very professional. The gloves themselves are quite adequate in wet weather and although they will improve your grip, their microfiber fabric will not give you the levels of control you get from high-end golf rain gloves. The fit is moderately satisfactory although the fingers of the gloves seem oddly longer than they should be. On the plus side, the mesh material dries really fast so if you’re a sweaty golfer, your palms should be kept dry through every swing. Not the best option out there, admittedly, but great for entry-level enthusiasts who don’t want to handle their clubs barehanded in the rain. The Titleist Men’s Perma-Soft Rain Golf Glove seems to prioritize user comfort above all else. Its sleek, white design is easy on the eye and very professional-looking. The glove’s build does not disappoint either, with a full cabretta leather palm promising you unimaginable gripping capabilities in wet, slippery weather. The glove features some excellently placed seams to ensure that nothing comes between you and the perfect grip. As for resilience, generous satin reinforcements around the cuff and thumb area promise to slow down the rate of wear and tear. Wearing the glove is an experience every golfer should anticipate: the interior remains dry, comfortably warm, aerated and soft, thanks to its water and perspiration-resistant fabric. The Titleist glove also deserves full props for incorporating the CoolMax mesh panel which greatly enhances the breathability, flex, and fit of the glove. 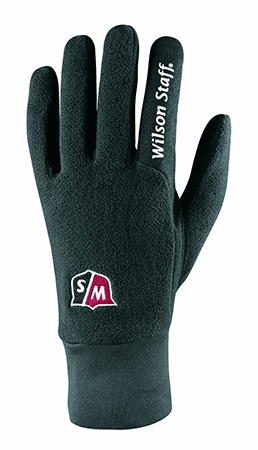 “Minimalistic” is the word that comes to mind when you first lay your eyes on the brushed fleece design of the Wilson Staff Winter golf gloves. They look simple, feel amazing, and fit perfectly for most sizes. One of the perks of owning this pair is that you won’t have to trade them for thicker winter gloves when it gets chilly; they are optimized to handle both wet and cold weather perfectly. The fabric of the gloves dries moisture extra fast so if sweaty palms are your undoing, consider getting this pair. There isn’t much to complain about when it comes to the fit and even less to say about the perfectly resilient construction of the gloves. However, it’s the suede palms that are a confidence booster since they provide excellent grip in wet weather. It goes without saying that Mizuno have shown some of the highest standards in the golf gear industry, which is why their RainFit Golf Gloves are some of the best out there. 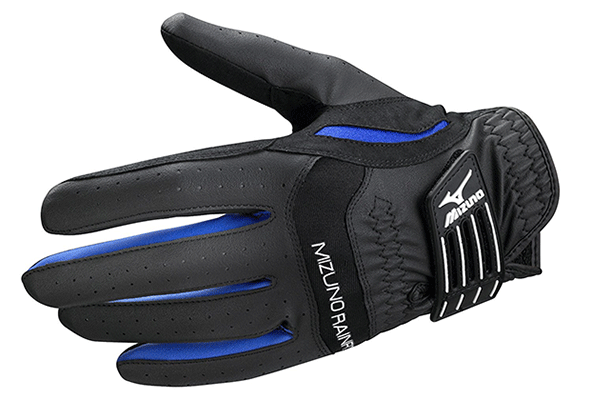 The golf rain gloves feature a sporty blue and black exterior design that looks every bit as premium as the glove is. When it comes to grip, the gloves work better in wet conditions thanks to their moisture-activated Clarino microfiber suede palms. The pre-curved 3D patterning of the gloves offers one of the snuggest fits out there, while the blend of synthetic leather, knit fabric, and polyester provides adequate comfort. FleshMesh inserts allow for maximum breathability and elasticity. The addition of the angled pull tab is also much appreciated, especially since it allows you to retain glove tension all through your swing. It is not easy to come across a solid pair of rain golf gloves below the $10 range but here we have found quality in the very affordable Orlimar Men’s RG golf gloves. They feature a professional-looking black and gray exterior design with a textured synthetic palm and thumb that provides quite an impressive grip in wet weather. The fabric of these rain golf gloves is surprisingly high quality with just the right amount of breathability and flex. However, don’t expect too much in terms of grip, although the embedded hexagon texture on the cabretta leather palms does improve your control a little when playing in the rain. Overall, these are a solid pair of gloves for that price, which offers quite good value for your money. These Orlimar rain golf gloves for women do more than just keep your hands warm; they’re made of waterproof polar fleece material that is extra comfortable. And for those who are worried about the gloves being too thick, you will find the textured synthetic palms quite thin and grippy even in terribly wet and cold conditions. As much as your swing is protected by the firm grip it provides, the gloves also feature a slightly diverse elastic wristband, which can make them a task to take off but are excellent at retaining glove tension. The quality of the fabric also feels resilient enough to take on more than a few rainy or snowy rounds on the green. 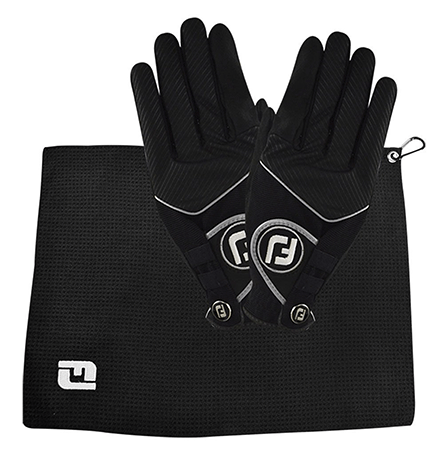 Simple, practical, and very stylish, these FootJoy rain golf gloves for men are a favorite among golfers of all expertise. The gloves work great in the rain thanks to their grippy suede palms. They’re also quite comfortable even for larger hands and look like quite the resilient pair. Excellent stitching keeps the seams from messing with your grip while ensuring that they are well protected from wear and tear. Whether you want them for the rain or for your sweaty palms, their moisture-wicking fabric will ensure that your hands remain dry throughout the game. For a mid-range pair, these are some of the most reliable rain golf gloves in the market. This rain golf glove might look docile at first glance but it is an impressive customer out there, especially for golfers who want full control and a powerful grip on their clubs. The build quality is up to scratch, with the glove featuring a bit of 3D performance mesh for extra breathability, moisture-wicking fabric to keep your hands dry, and a full suede microfiber palm that provides a firm grip all through your swing. The performance rain golf glove guarantees you a skin-like fit with its precision fitted design and a compression fit system that ensures it stays put on your hands. It is comfortably snug and does not migrate often, so you don’t have to keep readjusting it. If there is one thing that can be said about FootJoy rain golf gloves, it is that they are incredibly durable. These are no different. Made of highly absorbent fabric with super gripping capabilities around the palms, you will not regret owning this pair when you step out for a round of golf in poor weather. And for those who hate playing in the cold unprotected, these gloves, despite their thinness, are very warm. The fit is top notch, exactly like a second skin, while the material allows them to stay perfectly breathable all through. This bonus pack also includes a towel. 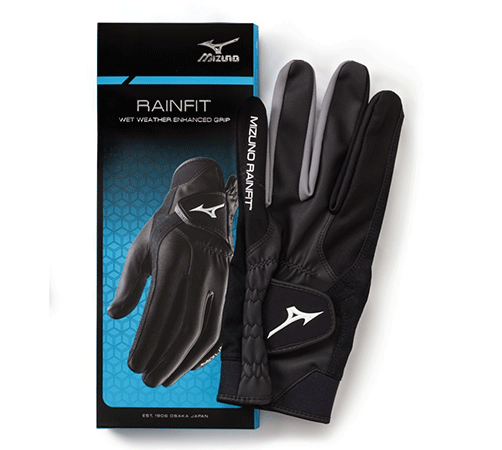 For a few extra dollars, the Mizuno RainFit gloves are definitely an amazing choice for golfers of all calibers. Not only are the gloves excellent in wet weather, they get even better the wetter it gets. This professional pair features the Japanese-made synthetic suede around the palms which offer incredible performances in wet weather. As for the fit, there were hardly any loose folds of fabric left over since the gloves cling to the hand like a second skin. Flex and elasticity are retained thanks to the well-placed mesh materials which also enhance their breathability. These are a top-notch pair of gloves that are made to survive more than a few wet rounds of golf. Featuring a unique one-size-fits-all design, this compression-fit rain golf glove rarely disappoints on wet occasions. It features an all-weather palm made of synthetic microfiber for impressive gripping capabilities in wet weather. A microfiber back ensures that there is plenty of ventilation to keep your hands dry and cool in humid conditions while the digitized palm grants you total control of your club through every swing. The glove also features a synthetic patch around the first finger that is specifically designed for providing a solid grip. It comes with a detachable tee and ball marker. Gloves can feel a bit too restrictive at times, which is why these Bionic rain golf gloves for men go the extra mile to ensure that you retain maximum hand movement. They achieve this using strategically placed bits of Lycra around the fingers to enhance dexterity significantly and make them more comfortable with you. The gloves use moisture-enhanced suede microfiber fabric on the palms to provide amazing grip in wet weather. Coupled with their patented pad system, which improves their durability but also enhances your grip, this pair is a more than sufficient companion when playing in wet weather. The gloves also feel light and fit perfectly without bunching up when you pull a fist. High-performance gloves are usually worth every penny and looking at this particular set of gloves, you will not be disappointed with your purchase. The rain golf gloves pack quite a grip thanks to high performance, full microfiber suede palms dotted with grip-enhancing HexaGrip™ honeycomb silicone which gets better when wet. WeatherTex™ mesh fabric not only ensures that the interior is well ventilated, it also dries up very fast. And to prevent that annoying bunching up around the fingers, the gloves feature reinforced finger bands that prevent the fabric around the fingers from twisting. To wrap up these fantastic performance gloves, they come with the moisture-wicking DriTex™ wristband to keep your hands completely moisture free. The Fit – Ensuring that a pair of golf rain gloves fit can be tricky for most players, but there are a couple of tricks that can help you out. First, the tip of your middle finger should fit snugly into the glove. There should be no loose fabric at the top. Second, when you clench your fist, your first knuckle should pull the fabric of the glove tightly over your hand. If there is still some room between the glove’s fabric and your skin, then the glove is too big. If you struggle to pull a fist, then the glove is too small. Grip – Getting a good grip on your club during a rainy game is the whole point of having golf rain gloves. As such, consider how well the glove grips all through your swing and how it handles in different levels of wetness. Thickness – Although thicker gloves might be a bit more resilient, they more often than not mess up your swing when they bunch around your palms. The ideal glove should be thin enough to feel like a second skin. Durability – Ideally, you should go for gloves that show a bit more resilience to wear and tear. There are some disappointingly flimsy options out there, so ensure you’re keen on the construction of the glove and the material it is made out of.